By far the most serious coup administered against freedom in Canada was the seizure of control of the federal Liberal Party by Pierre Elliott Trudeau and his leftist clique in 1968. Since Trudeau seized the levers of federal power Canada has been politically, constitutionally, and now economically in turmoil and disintegration. Language problems have been exacerbated, regional issues have been aggravated and the feeling of alienation and separation has spread across this country. And, of course, in foreign policy, Trudeau has shifted us onto the side of Castro and close to the Soviet Union. Forget the possibility of ‘revolution’ in our country. In Canada, the revolution was! 1941: Associated with anti-War and Red-supported Bloc Populaire in undermining war effort. 1945: Enrolled at Harvard, spawning ground of leftist intellectuals. 1950: Was in Shanghai when the Communists took over, and became a rabid admirer of Mao Tse-tung and his Red regime. 1951: Back in Montreal, he launched the leftist publication Cité Libre. Among the well-known Reds who collaborated, we note: Prof. Raymond Boyer (convicted of Soviet espionage in the Gouzenko Case); Stanley B. Ryerson, leading theoretician of the Communist Party and editor of Marxist Review; Pierre Gelinas, Quebec director of Agitation & Propaganda (“Agitprop”) of the Communist Party. 1952: Led delegation of Communists to the Moscow Economic Conference. 1953: Barred entry into the USA as an “inadmissible” person. 1955: Launched Le Rassemblement, a leftist “united front” rally in Quebec, but the CCF refused to join because it was too leftist. 1960: Led a Communist delegation to Peking for Red victory celebration. 1962: Amidst protests, this millionaire leftist succeeded in gaining appointment as a professor at University of Montreal, which became a pro-Castro stronghold. Appointed to executive of Red-line Canadian Peace Research institute. 1963: Campaigned with NDP against Liberals, whom he called “idiots” because they had decided to accept nuclear defence weapons. 1965: Having decided to use the Liberal Party as an instrument to propel himself to political power, he and leftists Jean Marchand and Gérard Pelletier became ‘Liberals’ and were elected to Parliament, where they formed the “New Guard” of the Liberal Party. 1966: Appointed Parliamentary Secretary to P.M. Lester Pearson. 1967: Named Minister of Justice. Credited in Communist press with intervening personally to reinstate hippie rag Georgia Straight, which had been banned by Vancouver Mayor Campbell for obscenity. Pierre Elliott Trudeau leads Communist delegation in Moscow, 1952. Bills paid by Communist Party of Canada. To the left of Canadian Prime Minister Trudeau is the report of the Reds’ International Economic Conference held in Moscow in 1952. To the right is the part of that report listing Canadian delegates. Former Communist Marcus Hancock has testified that the Canadian delegation, headed by Trudeau, was organized by Canada’s Communist Party, which paid the delegates’ bills. Hancock, himself a delegate, says everyone he knew in the delegation was a Party member. Introduced bill to legalize abortion and homosexuality, spearheading drive to shift Canadian justice from Scriptural to Humanistic basis. 1968: Moving, behind fantastic Press-TV buildup, towards leadership of Liberal Party and Primeministry of Canada. Two years ago, discussing his operation of the ship of state, Prime Minister Trudeau told an interviewer: ‘One has to be in the wheelhouse to see what shifts are taking place. I know that we have spun the wheel and I know that the rudder is beginning to press against the waves and the sea . . . but perhaps the observer, who is on the deck and smoking his pipe, or drinking his tea, sees the horizon much in the same direction and doesn’t realize it, but perhaps he will find himself disembarking at a different island than the one he thought he was sailing for. So steadily, but gradually, in the best Fabian style, did the Prime Minister spin the wheel and change our course, that an examination of our Canada just 13 years later reveals staggering evidence of an incredible revolutionary change. But let us examine a few more aspects of national security and the cover-up of subversion under the Trudeau regime. The prevalence of homosexuals in government enabled the Soviet Union’s KGB spy network to score its greatest post-war successes in Ottawa. The publication of Chapman Pincher’s book, Their Trade is Treachery, dealing with the penetration of the Free World’s secret defences by the Soviet KGB secret police, has created concern throughout the Free World. This book was also responsible for the startling revelation that John Watkins, Canada’s ambassador to Moscow for 1954-56, and his successor, David Johnson, were both blackmailed by the KGB through set-up pictures of homosexual encounters. The RCMP Security Service has likewise disclosed that a third ambassador, his name unrevealed, had also been blackmailed in similar circumstances by the KGB. Further revelations by investigative reporter Bob Reguly in the Toronto Sun in the spring of 1981, quoted a former top-level RCMP officer to the effect that the Watkins “affair” had unleashed a large-scale clean-out of homosexuals in government as security risks, with the hunt focusing on the External Affairs Department in Ottawa. RCMP sources indicated that they had identified 3,000 homosexuals in middle and senior positions in the civil service and wanted them all weeded out, but didn’t succeed. Many Canadians were somewhat puzzled in 1967, when the then Justice Minister, Pierre Elliott Trudeau, spawned his Criminal Code amendments which included legalizing homosexuality. Bob Reguly and others have claimed that when he became Prime Minister, Trudeau was instrumental in easing up the security restrictions on homosexuals, especially in External Affairs. 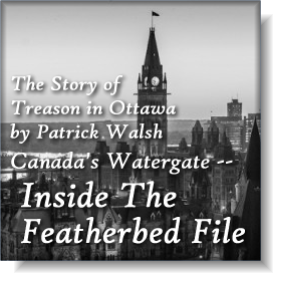 It was around this time that the first inkling of a “Featherbed File” became known, and for the next 13 years all attempts by the Opposition MPs and the mass media to have the “Featherbed File” made public was thwarted by the Trudeau regime. However the on-going security investigation pursuant to the “Gouzenko revelations ” of 1945-46 (which led to the arrest of fifteen top civil servants involved in Soviet espionage) brought out other aspects which have been carefully concealed by successive federal governments over a 60-year period.